Come 1996, you will believe that Chuck Norris can morph. 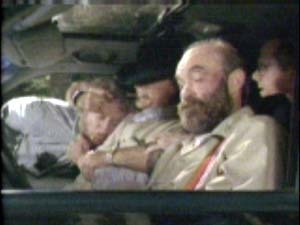 In this film made by people that must owe Norris a big favor, Chuckie starts out as an warrior of the olllld west. It seems they wanted to make him out to be a Native American, but failed. Well he is killed and takes a long roll down a short hill. Then it gets really goofy. The Chuckster is brought back to life by the spirits of the forest. A big bear stands over him and grunts a couple of times while Chuck is being filled by a funky light. By the power of Yellowstone, Norris is able to morph into a wolf, bear, or an eagle. Combine this with kung-fu and you have the next series to be picked up by TNT "Middle-aged Polymorphic Kung-fu Bearguy". After a couple hundred years, these five moppets are out in the forest and run up on a giant tree house with a disturbing entrance. They immediately commander the house as their own. Little known to them, "Big Nasty Co. Inc." is logging that particular forest, sot he kids decide to fight the man. 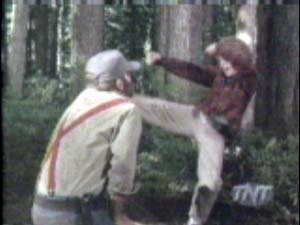 Chuck steps in at the last possible moment to save the kids hides and beat some loggers. Balthayzr> Is this gonna be bad? 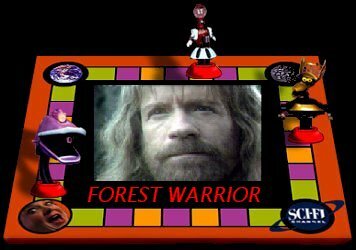 Does a Chuck Norris crap in the Woods? Balthayzr> They time compressed a movie they had made special for them? Balthayzr> Chuck Norris IS Steven Segal In Grizzly Adams: The Revenge!! Jamie> Screenplay by the fathers of frozen foods. Q> nymph, nymph, nymph of the forest, blonde as he can be....WHOAH!...watch out for that tree! Balthayzr> And thus, was Swamp Thing born! BillDoor> Come on, daddy! Is this any way to be on our honeymoon? * Jamie will put on pants and look for food. BillDoor> Okay...I've found the cheat list...to get Chuck to turn into a bear it's forward, forward, up, high punch. Daniel> This Movie should be called "The woods in my back yard Warrior"
bowleg5> I think that's how they pitched it to TNT... "Norris is bear... kids are dumb..." BRILLIANT! Let's go out and film this sucker! BryanL> I have to say, the eagle swooping transforming dropkick may be one of the dumbest things I've ever seen in any movie. Balthayzr> Yes, watch as 5 kids and a 5th rate Swamp Thing take on weapon-toting bad guys! It's fun!!" BryanL> Great. Big ol' batch shots. BillDoor> Oh, man, this is so *not* the movie I thought it would be. BillDoor> Bow, try turning into a bear! THX-1138EB> Damn you to hell Norris!!! BillDoor> The movie's so unsignificant they're actually running spots over it..
BryanL> Wait a second. Wasn't this movie OVER? Balthayzr> I learned Hong Kong Fooey is a better and much more believable hero. Ironf> I learned I could have been playing a video Game. "Hey, don't call me bonehead... BONEHEAD!" "We better hurry up or we'll miss the big shindig...."
"We just have to find a few men who aren't squeamish about fighting..."
"Damn stink puppies on the water"
"I have to put the fish a way or rags will eat them"
"What, am I surrounded by morons or something?" "I don't want to hurt him. I just want to strangle him. It'll make me feel better." "The only magic I believe in is the magic of the almighty dollar! Q> remember, kids - kick a man when he's down! i'm chuck norris - buy american! Q> and remember kids, if someone spites you, tie them to a log and push them over a cliff. i'm chuck norris - good night! Q> so remember, kids - solve all your problems through violence! i'm chuck norris...god bless!